On September 4, at the economic forum, held in Poland Latvian Foreign Minister Edgars Rinkevich spoke about the issue of Georgia's accession to the European Union. "Ukraine, Moldova, and Georgia have chosen the European path. They are trying to join the EU, and the EU should respond to their aspirations. The EU should recognize the prospects of membership of these countries and announce a deadline for their membership”, Rinkevich said. Georgia, Ukraine, and Moldova are post-Soviet states, with the problem of the occupied territories provoked by Russia. 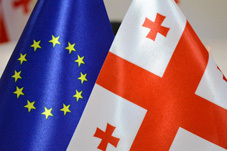 In 2014, Moldova along with Ukraine and Georgia signed an Association Agreement (AA) with the EU (Came into force in 2016), thus committing to the path of European integration. The agreement was an important milestone since despite the Russian pressure not to sign the document and instead remain in Moscow’s orbit, signing the Association Agreement at the same time was the message about countries commitment to European course. Nowadays Russia uses all its leverages to hinder the EU integration process in these countries, among them, are cultural, religious, historical, economic aspects. Thus, it is essential to accelerate the integration process, but on the other hand, to become the EU member states, Georgia, Ukraine and Moldova must take reforms in several directions. 1. A country officially becomes a candidate for membership. This does not necessarily mean that formal negotiations have been opened. 2. Formal membership negotiations stage, a process that involves the adoption of established EU regulations, preparations to be in a position to properly apply and enforce it and implementation of judicial, administrative, economic and other reforms necessary for the country to meet the conditions for joining, known as accession criteria. According to the Treaty of Accession 2003, Czech Republic ( Signed Association agreement - AA in 1995), Estonia (AA1998), Cyprus (AA 1973), Latvia (AA 1998), Lithuania (AA 1998), Hungary (AA 1994), Malta (AA 1971), Poland (AA 1994) Slovenia (AA 1999), Slovakia (AA 1995)became EU members in 2004; The treaty was signed on 16 April 2003 in Athens, Greece and it entered into force on 1 May 2004, resulting in enlargement of the European Union with 10 states. According to the Treaty of Accession 2005, Bulgaria (AA 1995) and Romania (AA 1995) became members of EU on 1 January 2007. And the last enlargement based on the Treaty of Accession 2011, on 1 July 2013, made Croatia (AA 2005) the 28th Member state of the European Union. As we can see, the period from the signing of an association agreement until the becoming the EU member is different for different countries. For example, for Malta it took 32 years from signing the association agreement, to become EU member, on the other hand, for Slovenia, it took only four years. It’s been four years since Georgia signed the association agreement and two years since it came into force.